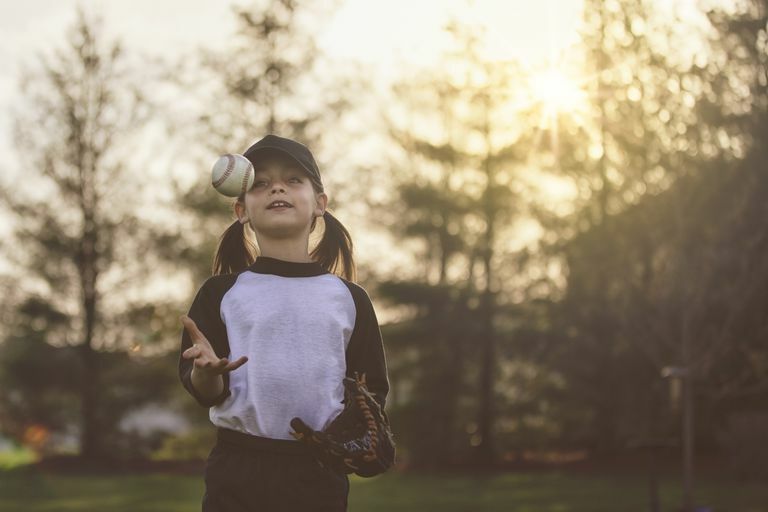 Most parents wouldn't think that an innocent game of softball could lead their child to the emergency room, but sports and recreational activities cause more than 40,000 eye injuries each year, according to the American Academy of Ophthalmology. Did you know that baseball is the main cause of sports-related injuries in 5- to 14-year-olds? Children often lack depth perception and sometimes misjudge the speed or distance of a flying ball—a mistake that could cause a ball to hit the face. However, according to Prevent Blindness America, 90 percent of sports-related eye injuries can be prevented by using proper protective eyewear. An injury to the eye can be serious. The most common types of eye trauma that can result from sports injuries are blunt injuries, corneal abrasions, and penetrating injuries. As with any eye injury, it is important to seek care from a doctor. Blunt injuries: Blunt injuries occur when the eye is suddenly compressed by impact from an object. Blunt injuries are often caused by tennis balls, racquets, fists, or elbows. They sometimes cause a black eye or hyphema (bleeding in the front of the eye.) Sometimes the eyelid can be bruised or discolored. More serious blunt injuries often cause broken bones around the eye and may sometimes seriously damage important eye structures, which could lead to vision loss. It's important to seek the opinion of an eye doctor if your child receives a blunt injury to the eye, as the injury may be worse than it appears. Sometimes bleeding can occur within the eye that isn't visible on the outside. Corneal abrasions: Corneal abrasions are painful scrapes on the outside of the eye, or the cornea. If you've ever poked yourself in the eye, you've probably had a corneal abrasion. The abrasion can cause a lot of pain, especially in the first few minutes. A corneal abrasion hurts so much because a layer of cells is actually scratched off the surface of the cornea. Most corneal abrasions eventually heal on their own, but your doctor may prescribe medication to help control the pain. Sometimes doctors will insert a "bandage contact lens," which is simply a contact lens with no power that acts as a bandaid during healing time. The most common cause of a sports-related corneal abrasion is a finger in the eye, a common event during basketball games. Penetrating injuries: Penetrating injuries are caused by a foreign object piercing the eye. Penetrating injuries are very serious, often resulting in severe damage to the eye. These injuries often occur when shattered glass from broken eyeglasses enters the eye. After a penetrating injury to your eye, you probably will be in serious pain and unable to hold your eye open. Sometimes this type of injury can even cause visible bleeding. Penetrating injuries must be treated quickly in order to preserve vision. Sadly, many people believe that wearing regular eyeglasses during sports will protect the eyes. The truth is, however, just the opposite. The lenses of regular eyeglasses can shatter upon impact by a ball, which could lead to a penetrating injury. All sports goggles and glasses should be made with polycarbonate lenses. Polycarbonate lenses are much stronger than regular lenses. Each sport has a certain type of recommended protective eyewear, determined by ASTM International (a global standards developer). High-risk sports that require protective eyewear include basketball, baseball, hockey, football, lacrosse, fencing, paintball, water polo, racquetball, soccer, and downhill skiing. In order to protect your children's vision, you must be proactive in protecting your kids' eyes during sports activities. Many youth and children's teams don't require eye protection, so insist that your children wear safety glasses or goggles whenever they play. Also, remember to set a good example by wearing eye protection yourself. Do You Really Need Special Glasses to Watch a Solar Eclipse? Is UV Protection Important for Your Eyes? Discount Reading Glasses Are a Bargain But Will They Harm Your Eyes?